You’ve invested in quality poly drums for safely moving and storing hazardous materials in your facility. But poly drums alone might not be enough for the job. Depending on your application, you may also need accessories that make your poly drums easier to use and make material transfer safer. A spill or splash is the last thing you want to deal with while handling potentially dangerous materials. Use a funnel on closed-head drums to avoid a transfer mess and make waste collection easy. For extra protection, combine the funnel with a drum pad topper to clean and protect the top of the barrel and surrounding areas. If you’re using your poly drums to contain flammable or combustible materials, you must store them in a safety cabinet, such as a drum storage cabinet, to reduce fire hazard. Such cabinets can help you comply with OSHA 29 CFR 1910.106 and Uniform Fire Code 79.202 regulations. Drums can be stored vertically or horizontally in the storage units, and the cabinets are labeled with flammable and hazardous waste signs. An additional drum storage accessory is an industrial drip pan, which can be placed under a drum spigot to keep the storage area safe and clean. 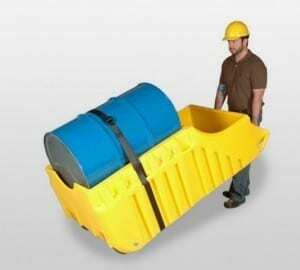 Transporting a full poly drum container can be tricky — unless you have the right tools. Single-drum pallets or carts make drum relocation easier and safer and are ideal for on-the-go dispensing. The pallets are very durable and resistant to corrosion, and the poly grates are removable and easy to clean. Poly drums should make your job easier, not harder. With these handy tools, material storage, transport, and dispensing will be simpler — and safer — than ever. Always use a funnel when transferring chemicals into a new container. It’s not uncommon for employees to accidentally spill chemicals and liquids when transferring them into different containers. This may not seem like a serious problem, but even nontoxic chemicals can create a serious risk for slip-and-fall injuries in the workplace. Allowing small amounts of motor oil or similar lubricants to drip onto a solid concrete floor will result in a slippery surface that’s an accident waiting to happen. The safest and most effective way to transfer chemicals from one container to another is through the use of a funnel. Whether you’re it’s 1 gallon or 50 gallons, all liquid-based chemicals should be poured through a funnel to reduce the chance of spills. The wide, open body of a funnel keeps the chemical contained so there’s less risk of it dripping into the floor. 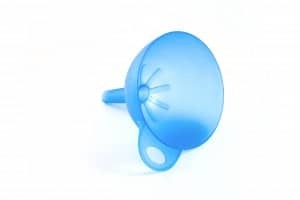 A high-quality funnel should feature a chemical and rust-resistant polyethylene design along tall sidewalls to prevent unwanted splashing when transferring liquids. It’s important to note that only designated funnels should be used for transferring chemicals and liquids, not makeshift funnels. Pouring gasoline through a foam funnel, for instance, wouldn’t work, as the gasoline would burn straight through the foam material and possibly burn the worker’s hands and body. Note: there are certain types of funnels designed specifically for drums. 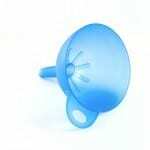 If you intend to transfer chemicals or liquids into a 30-gallon or 50-gallon drum, stick with one of these funnels. Pour the chemical as close to the funnel as possible so there’s less risk of splashing. Check the ground beforehand to ensure it’s free of spills and obstructions (you don’t want to slip while transferring the chemical). Secure the funnel to the ‘new’ container before pouring the chemical or liquid. If you intend to reuse the funnel, thoroughly clean it after each and every use. Check your local state laws to determine the correct method of disposal for chemical-ridden funnels. Another important measure that’s often overlooked when transferring chemicals into new containers is to perform the transfer on a flat, even surface. Even slight grades will significantly increase the chance of a spill. Set both the current and new container on a flat surface and then begin the transfer through the funnel. When you are finished, checked to make sure none of the chemical has spilled on the floor.